One of the good things about working with an independent wrestling organization is seeing the talents of so many different young, up and coming wrestlers. Pokerface is no exception to this. So far, he's undefeated in AAPW (All American Pro Wrestling). That's an impressive feat because there are plenty of heavy hitters and future superstars in the AAPW locker room. And because he's yet to have his shoulders pinned to the mat, he's making an open challenge. At AAPW Main Event on January 14, he's taking on anyone who will step up to the plate. It's a bold move, as there are any number of guys who are capable of cashing in on Pokerface and adding a blemish to his spotless record. 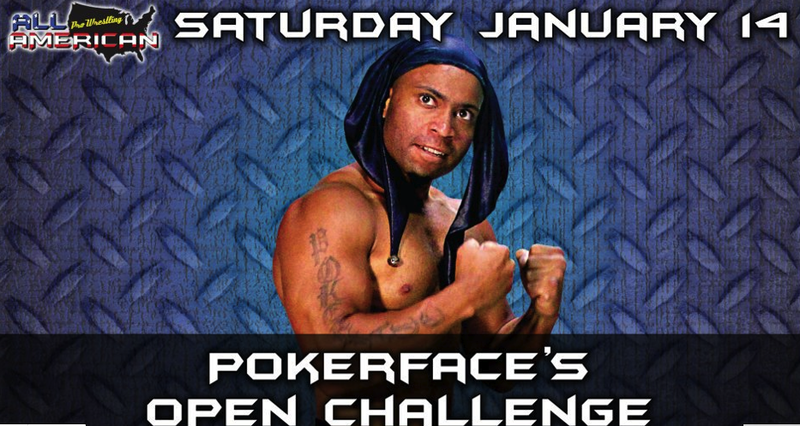 The other interesting element here is that Pokerface doesn't know who he'll face, so it's hard to prepare for a contest like that. However, he's got the ability and talent to compensate for not having a lot of prep time prior to the sound of the bell. I would have to assume whoever the challenge ends up being will face a lot of pressure to bring the streak of AAPW to an end. 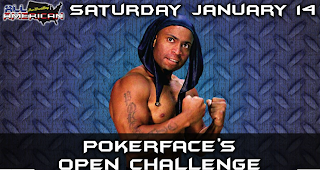 Will the New Year start off with a loss for Pokerface or will he continue to dominate the roster here at AAPW? Join us on January 14 at 6:45 p.m. to find out. Tickets are only 10 bucks and are available online. Just click this link.